Including this defending queen… Nicki Minja. 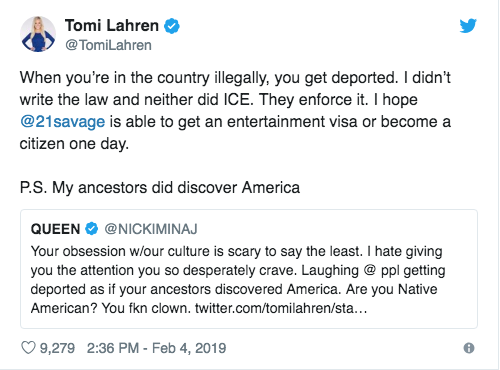 When the Alt-Right spokeswoman Tomi Lahren mocked 21 Savage’s deportation crisis Nicki Minaj (also a child of Caribbean immigrants) stepped up to defend him & his young family. Now, there is talk which says Minaj’s fans have accessed & released Lahren’s personal number because they felt the manner in which she responded to the rapper was frightfully rude. This comes after the members of the same fan base are alleged to have assaulted the mother of aspiring rapper Mariah Lynn in broad daylight in response to diss tracks Lynn penned about the “Super Bass” songstress. Climb on The Family Tree below & share your thoughts about My Niece Nicki Minja’s ringing situation. Feb 5 Jogger Survives Mountain Lion Attack then Kills It with Bare Hands!!! Aug 20 Nicki Minaji Causes Crowd 2 Get Stupid Dumb… Short Bus!! !